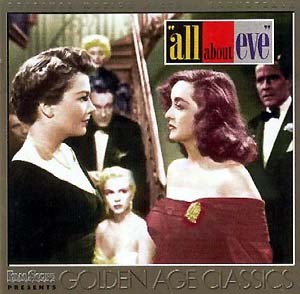 One more Soundtrack of the Week for 2015, #402, Alfred Newman's music for All About Eve and Leave Her to Heaven. These are both great movies, perfect syntheses of talented professionals working at the height of their abilities. Of course the music plays a huge part. Newman's score for All About Eve makes use of one of his most lyrical and stirring themes. The variations and orchestrations of it, in combination with the different themes that are spun off of it, are dizzyingly impressive. While All About Eve is a dazzling drama/comedy set in the world of Broadway theatre, Leave Her to Heaven is an audacious melodrama in which Gene Tierney plays one of the great screen psychos. The music is accordingly different, with Newman using brass and timpani to prod the viewer with dread and strings to summon up moods of sadness and anxiety. Of course the whole thing is quite beautiful.